WriteOnCon 2019 is just a little over a week away, but you don’t need to wait that long to start working on your writing — the public critique forums open February 1! To help you get ready to jump in with your manuscript, we’ve prepared some instructions and guidelines. The forums can be reached from the navigational menu on our website, or directly by going here. You can browse the forums as a guest, or you can post and interact with others by logging in. Accessing the forums is and will always be free. They will be open until next year’s conference, at which point the boards will be archived and new ones created. PLEASE NOTE that your forums login is separate from your WriteOnCon.org login! Our forums are hosted off-site by Proboards for your security. 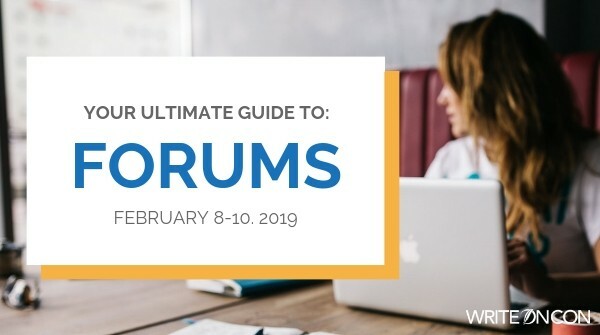 If you do not already have a forums account you will need to create one, even if you already have a WriteOnCon.org account. NOTE: Proboards requires that you enter a gender, and only offers a binary choice. If you are uncomfortable with these options, you still must pick one to sign up (we’re sorry!) but you can hide the gender from display by changing your profile settings. We highly recommend setting up a signature that includes your posted manuscript materials, if you choose to share them. At a minimum, include your manuscript’s title and genre, and the links to the threads for your query and/or first 500 words. This will help other writers easily find more from your manuscript if they are interested (this is especially useful for people wanting to reciprocate with feedback!). There are instructions for doing this posted in our Welcome boards. Once you’ve registered and your profile’s set up, you’re ready to start posting! To start a new thread, navigate into the board you’re interested in posting in and click on the yellow “Create Thread” button at the upper right. When viewing an existing thread (including your own), to reply click on the yellow “Reply” button at the upper right, or scroll to the reply box at the very bottom. Guidelines for starting critique threads are sticky-posted to the top of every board. Please make sure you read these! Following the guidelines will make it much easier for other writers to leave critiques on your manuscript, and will ensure a fair and enjoyable experience for everyone. Our moderators will be monitoring posted threads and will remove any that are offensive, inflammatory or otherwise problematic. In the critique forums, we strongly request that you “pay it forward” once you’ve posted your own manuscript for feedback. Please try to leave constructive feedback (eg., more helpful than simply “this is great!”) for at least five other manuscripts besides your own, within the same board (eg., if you posted yours in the First 500 Words board, please leave feedback on five other threads in the First 500 Words board). We also encourage writers to “pay it back” – if someone leaves feedback on your thread, it’s a wonderful gesture to not only thank them, but also swing by their thread to leave feedback of your own (this is where having your links in your signature is a great help!). Reciprocated feedback can count toward your five critiques. We have 15 Superheroes who will be browsing the forums throughout the conference. These people are literary agents and traditionally published authors — and with their powers combined, they offer copious experience that they’ll be sharing by offering feedback on your materials. Our Supers will be hanging out exclusively in the Superhero District this year. We encourage writers to polish up their materials in the main subforums first by gathering feedback from fellow writers and revising as necessary. Once your work is shining, you can then post it in the appropriate board in the Superhero District for feedback from our Supers. You won’t be able to edit your materials once you’ve posted them, so make sure they’re the best they can be! Also, only Supers can leave comments in the Superhero District boards; you can post on your own thread, but no one else’s there. For more detailed instructions and rules about participating in the Superhero District please check out this thread. All of our Supers will be wearing their hero identity. SuperAgents will be completely anonymous – you can identify them by their mysterious name and the stars in their avatar. SuperAuthors wear their alter-ego proudly – you can identify them by their dual identity and the quill held by their avatar. For a full list of our participating Supers, check out our announcement here. Superheroes may pop into the forums at any time between February 1 and February 13. We ask that you allow them their privacy and please do not contact them directly. If they leave a comment on your materials, feel free to reply to it. You may not necessarily agree with everything they say, but please be gracious in your response — they are simply offering their honest, subjective opinion. In some cases, a SuperAgent may like your manuscript so much that they would like to request to see more of it! Lucky you! All manuscript requests will be made through Private Messages within the forums. To check your messages inbox, click on “Messages” in the navigation bar. The SuperAgent will provide instructions there on how to submit your manuscript materials to them. Please keep their identity a secret!